22nd July to 25th July - Report plus photos. We went on the Thursday the weather was dry with sunny periods and an occasional cool breeze. 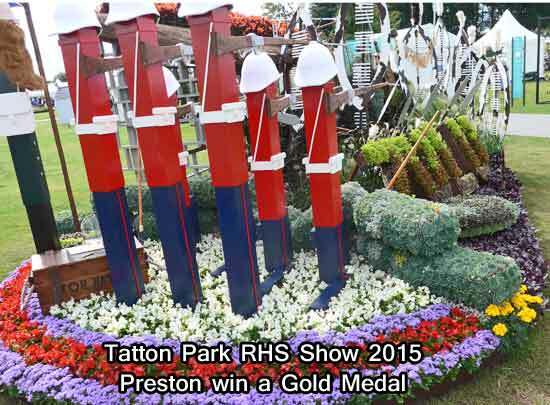 A huge show and we arrived at 10am as the gates opened so had a lot of space for a while till it got busy. From the north you're signposted off the M6 at Junction 20 and it's a good road all the way, traffic was good earlier as well. There is an amazing amount of stuff going on, too much to mention. 'The flower bed was created to provide a floral representation of the famous 1879 battle of the defence of Rorke's Drift in Natal, South Africa during the Anglo-Zulu War when the British held out against an overwhelming Zulu force, an action that saw eleven Victoria Crosses awarded to honour bravery in battle. Much of the inspiration for the design was drawn from the story fo the Revererend George Smith, an army chaplain who was commended for his actions in the battle. Reverend Smith spent the latter part of his career at Fulwood Barracks in Preston. He is buried in Preston Cemetery. The Gold Medal and images of George Smith and the painting of the battle. We saw a crowd and headed that way as you do. 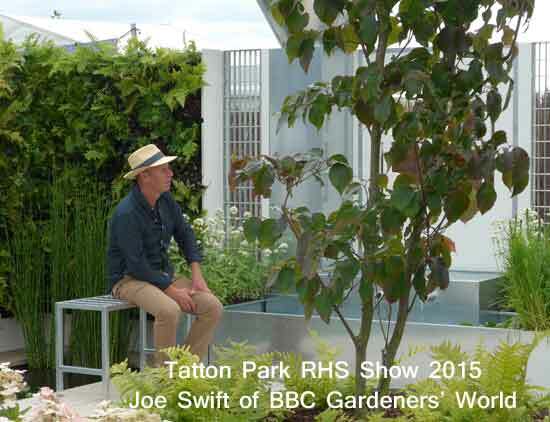 It was Joe Swift of BBC Gardeners' World talking about one of the garden displays. 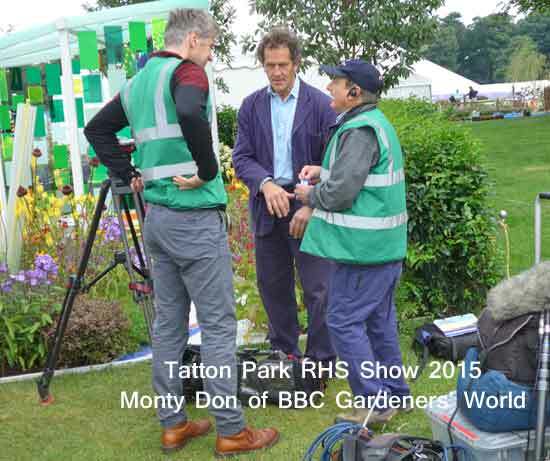 Looking a bit further there was another crowd to see Monty Don of BBC Gardeners' World. Amazing what a ruffled style in a baggy blue cotton suit with braces can do to the ladies. Monty is a soothing character unfortunately Nigel wasn't with him. Manchester Art School had created a mirrored shed made of acrylic as an exercise in hidden sheds. To cap it they mirrored the inside and fitted strange lights. 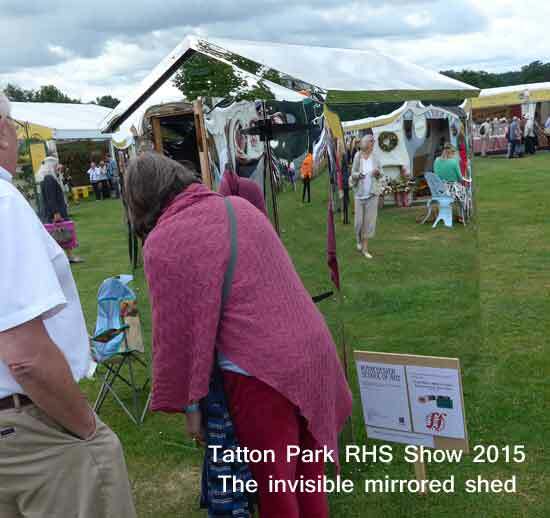 It was a freakily invisible shed, brilliant. 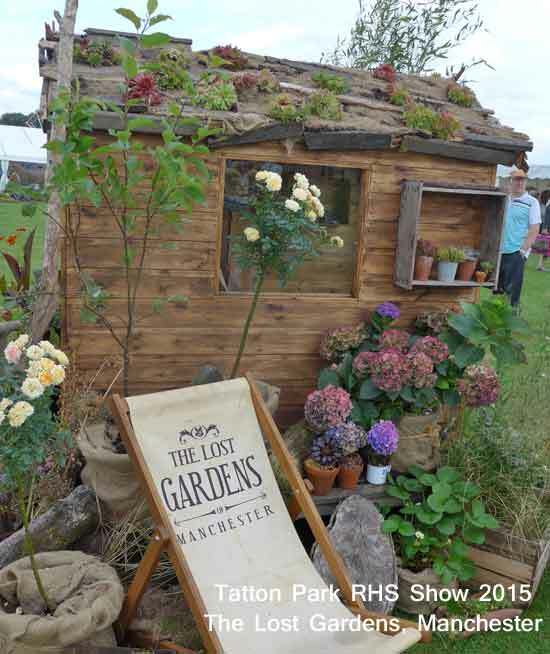 The Lost Garden on display at Manchester Art Gallery was at Tatton. 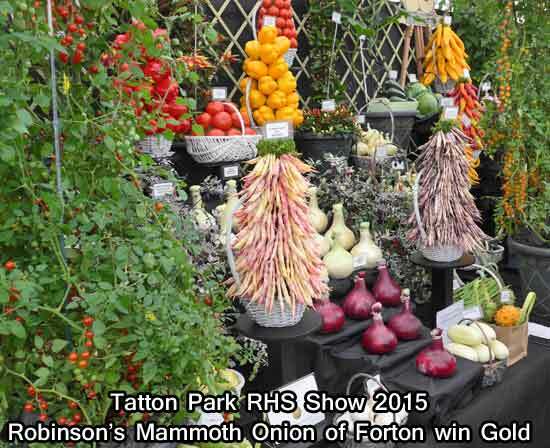 Robinson's Mammoth Onion of Forton between Preston and Lancaster won their usual Gold Medal for a magnificent display of vegetables. 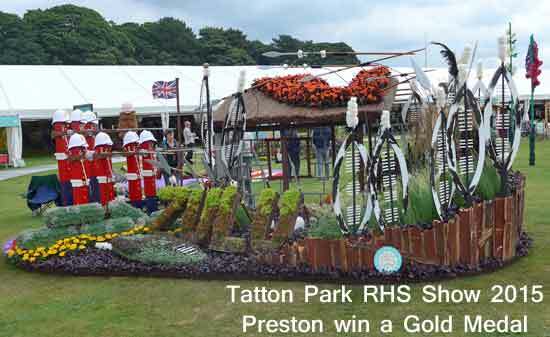 Click here to see their displays since 2006 on our Food page. 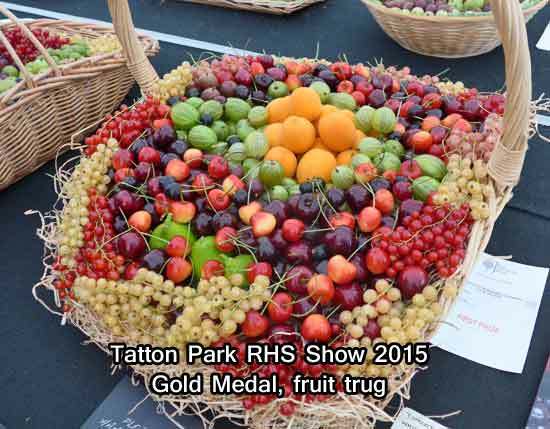 The Fruit Trug always looks delicious. 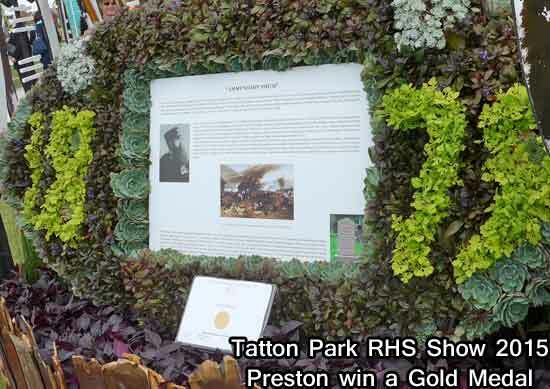 A grower from Nottingham won Gold. Wonderful. Grand Design or not? 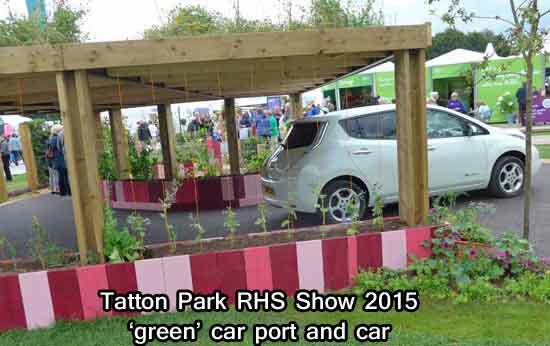 A car port with greenery on top and an electric car. The car port looks great. Tempting. 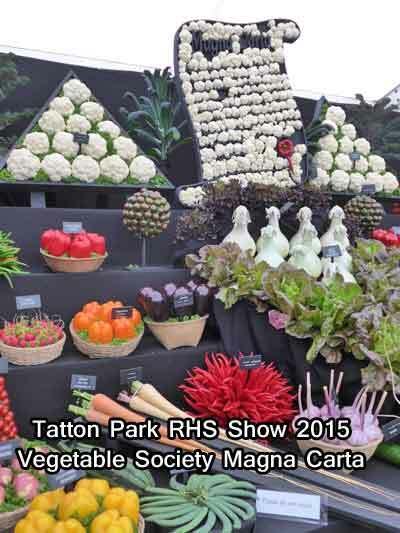 The Vegetable Society did an imaginative display with a Magna Carta made of small Cauliflowers. 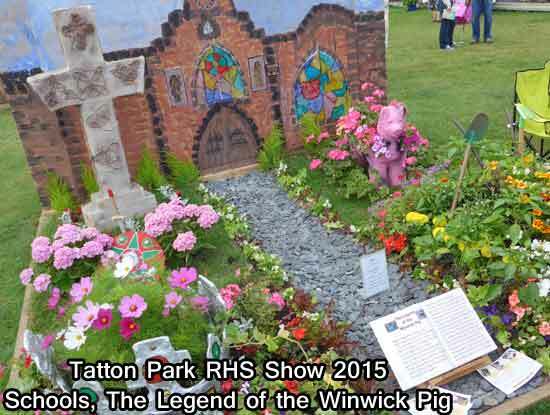 The school displays are always interesting and this one of the Legend of the Winwick Pig caught attention. Legend says tht King Oswald of Northumbria died in battle in 642AD. Travellers would leave tributes to him on a stone that marked the spot were died. It was decided to build a new church in Winwick and one night a pig ran from the site and moved all the stones to where Oswald had died. The pig was carved into the stone of the church and in 14th century it was rebuilt using the same stone and there is a carving of the pig. The village is Winwick near Warrington. A story to rival Peppa. 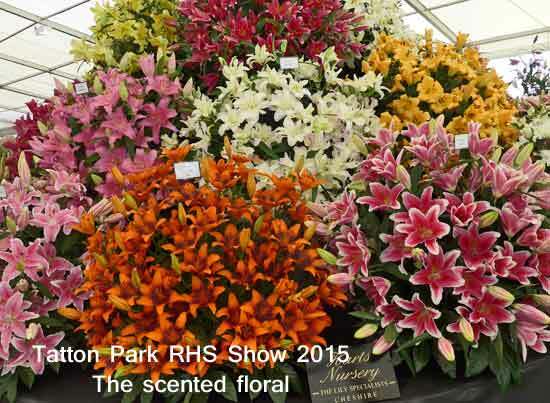 The huge Floral Marquee has flowers of all descriptions. Lilies, richly scented. 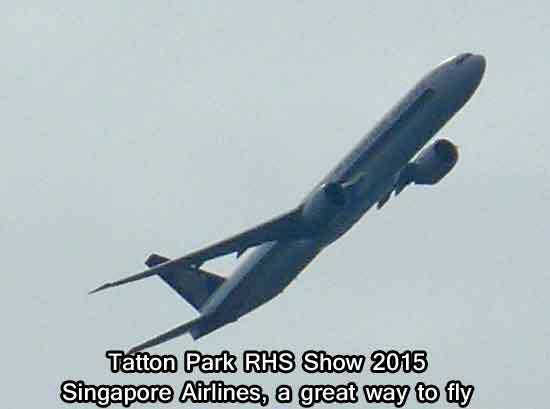 Added interest is supplied by the passing flights from Manchester Airport. Singapore Airlines Boeing 777 departing in the morning.